Last night I had a dream about genealogy. In this dream I learned that my great-grandfather was actually adopted. I never heard this before, and was anxious to research it further. He told me who his biological father was. I was excited to know the real name. Somehow I knew that I was dreaming, and so I repeated the name over and over and over so when I woke up, I would remember it so I could further research it. I don't usually wake up in the middle of the night, but last night I did - several times. I'd wake up, repeat the biological father's name in my head several times, then go back to sleep. I also have a recurring dream of a family bible that I know contains the answers I've been searching for. As I bring the bible closer to my eyes so I can read the information on the "Births" page, all of the text goes blurry and I cannot read a thing. Oh how frustrating these dreams can be. The solution. It is usually in the middle of the night when I am laying in bed thinking about how to solve a genealogy problem that an idea comes to me. Sometimes even in dreams. To ensure that you do not forget these potentially "inspired" ideas, make sure that your laptop is always on your nightstand, turned on, with Legacy's To Do List open. Simply create a new To Do task, enter the "inspired" information, click Save, and go back to sleep. You'll never forget that great idea when you wake up! The beefed up search options are one of my favorite and most used new features. Far more robust than V6. She's right. One of the "smaller" new additions in Legacy 7.0 is one of the more powerful new features. First, to access the Searching tool, just click on the Search icon in the main toolbar. There are two new tabs: Missing Sources and Missing Information. Using the new Missing Sources tab, Legacy will present you with a list of persons who do not have a source for a specific event. For example, if you wanted a list of everyone that does not have a source for their birth, just choose the "Birth Date and Place" option, then click on Create List. 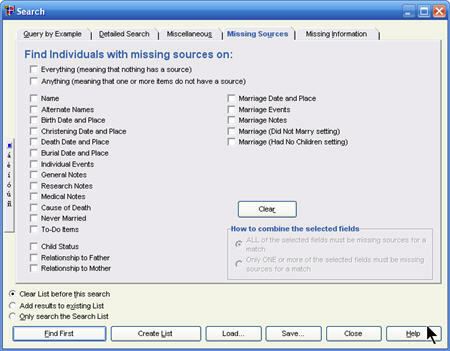 See the image below for other ways of searching for missing sources. Then, use Legacy 7.0's new SourceWriter to enter your citations according to the Evidence Explained standards. Happy Searching from everyone on the Legacy 7.0 development team! This message is important to read only if you at any time installed the pre-release edition of Legacy Charting AND you installed Legacy 7. As you may know, Legacy Charting's Pre-Release Edition will expire on June 15, 2008. When you installed Legacy 7.0 Deluxe edition, Legacy was supposed to "override" the Pre-Release edition of Legacy Charting with the Deluxe edition of Legacy Charting. Well...it didn't. We've identified the small glitch and have corrected it. Therefore, if you installed both the Pre-Release Edition of Legacy Charting AND you installed Legacy 7.0 Deluxe Edition, you will need to download a special update. If you do this before June 15, all you need to do is open Legacy Charting, click on the Tips & Updates tab, and click on the button in the Updates section to download and install the new update. If you do this on or after June 15, when you try to run Legacy Charting, you will receive a message that directs you to the Legacy Charting website. There you will find a link to download the update. Elizabeth Shown Mills' Evidence Explained is the definitive guide to the citation and analysis of historical sources, and is the perfect companion to Legacy Family Tree 7.0's new SourceWriter™. Now, for the first time, the electronic (PDF) version is available for purchase in the Legacy Online Store for just $24.95. BONUS OFFER: receive 20% off on a Footnote.com subscription with your purchase of Evidence Explained. With Evidence Explained and Legacy 7's SourceWriter™, documenting your findings has never been more fun! We want to update all of you on the status of Legacy 7's release. I, personally, finally have a few minutes to sit down and write this brief post. Like Ken mentioned in our last article, we've never had such an enormous response to the release of a new version of Legacy. The volume of orders required us to purchase many new computers and workstations, and hire about a dozen new people to help with order processing, email responses, telephone calls, and shipping. They've even needed my help! Each morning I arrived at the office, at least 4 others had been there all night. They would continue to work throughout the next day, until we convinced them to at least take a nap. I'll just say that we've all experienced something we haven't experienced in a long time - the beautiful Arizona sunrise. Like Ken wrote, we thank all of you so much for supporting Millennia and our new Legacy 7. All free upgrade orders have either been mailed or emailed. If you qualified for the free upgrade, and you have not yet received the email with the installation/unlock instructions, the first place to check is in your email program's spam/junk folder. The majority of the customers we have communicated with eventually found the email there. If you have not yet done it, please add CustomerService@LegacyFamilyTree.com to your email program's approved list. We are finally caught up with the voice mails you have left us. Thank you for your patience as we have worked down the list to call everyone back. New orders are now back to our usual same/next day processing and shipping. Most are mailed via USPS priority mail. We are not yet caught up with all of the emails. Last night we set up another workstation to help us get caught up. We hope to be caught up within the next few days. Finally, make sure that when you place your order, that you double-check your email address. In numerous cases, the reason the customer has not received the email from us is because the email address we have on file is off by a letter or two. If for some reason you feel that you haven't yet received a response to us, please send us an email to CustomerService@LegacyFamilyTree.com or give us a call at 1-800-753-3453 or 1-623-444-8918 (outside the USA). If we don't answer, please leave a message and we'll get back to you as soon as possible. We thank you again for everyone's patience and for the great feedback we've had with Legacy 7. Yes, we've learned a lot along the way, and know we still have room for improvement. We will continue to do our best to bring you great genealogy software. We would like to give thanks for everyone's support and patience as we worked to get Legacy released. We did have a plan which we felt was a great plan. However, even with all the extra people that we hired to help we have been totally overwhelmed. We have had very successful releases in the past and so we thought we knew what was coming. Boy did we underestimate things by a long, long ways. In the first 48 hours we have had 10 times more orders than with any other release. We have had a couple sales days that blow away anything we could have ever dreamed of. We have so many orders that we can't even process them. Things are fairly automated and can usually be done very quickly but we have so many orders coming in that they are stacking up everywhere. We have never seen anything like this before in our company's 25+ years of being in business. We have several people working the phones and several doing email all day long (literally 24 hours a day). All we can say is THANK YOU!!! Thanks to all of you for your purchases you have made! We really hope each of you enjoy the new features we have worked so hard to add to Legacy. You deserve the best and we hope we can continue to earn your support for many years to come. Last night and this morning I was working on scrounging up computers from everywhere I could find and working on getting them added to our network and ordering system so we could add additional people to help out right now with all the extra orders. We hate to ask but if you don't have your order yet if you could be patient for a couple more days before calling. That might help us get things done a little quicker because we can have people working on getting the orders out instead of individually answering phone calls and emails. Thanks for helping us experience such an overwhelmingly successful release of Legacy 7.0. All of you are so awesome with all you are doing to help each other out. Keep up the good work and we'll work hard to get your orders out to you quickly. SURPRISE, Arizona, June 4, 2008. Millennia Corporation, a leader in family history software, today announced the release of Legacy Family Tree 7.0. The new release contains dozens of significant new features and enhancements, including the first-ever SourceWriter, automated family mapping, and brilliant wall charts. In one software package, Legacy Family Tree 7.0 provides tools to help users record their family’s history, organize their pictures, perform their research, and share their findings. Mapping – Use Microsoft Virtual Earth to automatically pinpoint and plot important locations in ancestors’ lives from within Legacy. See 3-D, satellite and bird’s eye images of where your ancestors lived. Now it is easy to track your ancestor’s migration. Wall Charts – Experience the enjoyment of showing off your family tree by producing stunning full-color wall charts – ancestor, descendant, fan, hourglass, bow tie, and even DNA charts. Use them for your next family reunion or for a deserving wall in your home. SourceWriter – Cite your sources easily and correctly with the new SourceWriter. SourceWriter makes it simple for you to select the correct input screen so that you enter all the pieces needed to correctly cite any source of information in the thousands of formats that exist for them. The information you enter is correctly and precisely formatted to match the genealogy industry standards for source citations when printing footnotes, endnotes, and bibliographies. Multiple citations for an event can be combined into one paragraph, thus avoiding a long string of superscripted numbers within the report body. Interview Reports – Choose from over 1,200 carefully pre-written interview questions and memory triggers to help you capture your family’s memories before it is too late. Guided Setup Wizard – Getting started with Legacy is even easier now. The new guided setup wizard takes you by the hand and guides you through the setup process in an easy-to-understand way. New Relationship Calculator - See how any two people are connected, not only through direct blood relationships but also by marriage. A person might be the "great-grandfather of the wife of your 2nd great-grandnephew. You can also specify how many of these non-blood relationships you want to see. More Powerful Searching – Searching your Legacy data is easier than ever before. 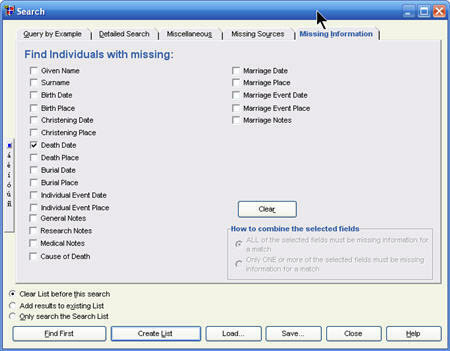 You can now search for individuals that are missing parts of names, birth or death information, marriage information and much more. You can also search for missing source citations as you document your family files. Now Attach Any Document to Individuals and Marriages - Along with attaching pictures, sounds, and video to individuals, events, locations, and sources, you can now also attach any other kind of document (PDFs, Word files, etc.). Enhanced Backups - Legacy can now backup your family file and multimedia files at the same time, making it easier to transfer everything to another computer. Edit Records from the "Used By" Lists - All of the master lists in Legacy have an option to view the individuals who use the items in the list. You can now edit those individuals right from the list instead of having to exit the list and edit them separately. Standardization Tips – New alerts will appear if something questionable has been entered in the Individual's Information screen. This helps users keep their data standardized. Best Fit Child Columns - The new Best Fit option in the Family View expands or contracts the child list columns to fit the number of children for the current couple. No more trying to guess the optimum number of child columns. Legacy does it for you. Watch the What’s New Video at http://www.legacyfamilytree.net/videos/new7/What'sNewInLegacy7.html. 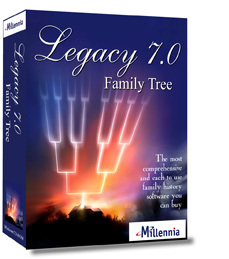 Legacy 7.0 is now available at www.LegacyFamilyTree.com, for just US $29.95 for the download-only version or US $39.95 version which includes the 336-page printed user’s guide, installation CD, and beginner’s training video. Upgrade pricing is also available for current Legacy 6.0 Deluxe users. The free, Standard edition can also be downloaded from www.LegacyFamilyTree.com. Or call 1-800-753-3453. Legacy 7.0 is also set to be released in select retail stores this summer.